Welcome to Pull Sign, the sign source site that allows you to create and print open house signs instantly. Select a standard yard sign title such as open house or type in your own title such as open home. Choose Red, Blue, Black or White color for the title and the sign background or print a Black and White real estate signs if your printer does not print color. Make as many professional looking lawn signs as you need using your own printer. Type in contact and item information below the title instead of hand writing it, so it can be read from a distance. Add to the garden signs a directional arrow to help guide the sign viewers to a desired location if needed. Increase your sign dimensions by printing them on 2, 4 or even 9 pages. Although you print a sheet of paper sign, you can easily protect it against the elements. Whenever possible post it with its face over a glass surface such as a window, a glass door, or a car window, or wrap and seal it with a clear food plastic wrap before placing it on a frame. In order to create your real estate sign in an efficient and quick manner, click on the buttons on the wooden direction sign structure on the page left in an order according to their number from left to right and top to bottom. Each button controls several states of a specific feature such as Title Headline and Background Color. For example, cycling the Background color button rotates the background color between Red, White, Blue, or Black states. It is a good idea to press each button several times until the whole cycle has been played in order to review all the states available. The state the sign was in before the button was pressed will reappear once you have cycled all the states. Positioning the cursor on a button brings out a helpful description of the button function in this text area. You may want to read it in order to get a good understanding of what aspect of the sign design the button controls. A realtor sign that you can post outdoor. You can create a large sign by printing it on multiple pages instead of one. For example, you can create an attention grabbing 4 page sign. Multiple page sign have a greater visual impact, but requires taping or gluing together the separate pages the sign is printed on. Cycle this button to select your sign size. The size selected is shown on this button once you have selected it. In order to create a multi page seamless open house sign layout, before attaching the sign together, cut or fold the blank bordering margin of one of the two pages you are attaching each time. In order to hide the untouched margin, place the section with the removed margin on top of the section with the untouched margin and adjust it into exact place. When you press this button a stub fill in form appears. 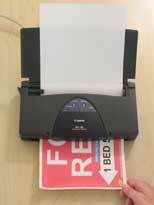 Create a tear off stub page that can be attached to the bottom of your printed sign. Adding a stub tear off page to your sidewalk signs can greatly increase the response to your sign as it allow sign viewers an easy way to retain the sign relevant information. Type in the form two empty lines. The information that you want to appear in the tear off stubs. When you finish typing a Yes/No applet will appear asking you whether you want the tear off stub page to be printed along once you print the open signs. If you choose Yes the stub tear off page will be printed when you press the print button, along with the custom sign that you have configured. If you want to change your choice at any point after you are done with the Tear Off stub button, press it again and the Yes/No applet will reappear and allow you to select a different choice. You can also edit the stub text at that point. Before placing the printed Tear off Stub page, separate the individual stubs by cutting with a scissor their perforated edges. You can attach the tear off stub page either directly to the realtor sign or to the support area where it is attached to using scotch tape or plastic glue. In either case place the tear off stub page in a way that one row of tear off information stubs fully appears beneath the sign. In case you choose to print a multiple page outdoor signs using the size sign button and a tear off stub page, pullsign automatically prints the right number of tear off stub pages to cover the whole bottom edge of the enlarged signs. Cheap realty sign color printing you can do from home. Cycle this button to select your realty sign outline color. Ink Save Mode allows you to make a colorful professional looking cheap yard signs while saving on cartridge ink. The savings occurs because the printer applies color only to an outline around the signage instead of covering the entire background with color. Ink Save Mode is your best choice if you use a small inkjet printer. Due to short use life and low cartridge tank ink storage capacity especially if the cartridge ink tanks are not full or nearly full a small home printer may not be able to execute coloring the whole background properly or run out of ink before completing a full background print job. Printable garage sale signs website where you can put together and execute your design ideas. For rent sign template that house owners can modify and place by their property. For lease signs that you can customize for your business.